There are currently 5 Charlie Prose CDs/Cassettes now available. Each and every one is completely different. We guarantee his comedy will make you forget your troubles and let you lose yourself in hours of laughter. "This album is dedicated to America's Senior Citizens. It was recorded in the hope that it will bring to them as much joy and laughter as they have given to me. Always keep a smile on your face and laughter in your heart." "The Funny Side of Prose"
laugh-ter (laf'ter), described by many as life's greatest natural medicine. It relieves stress and can even eliminate many physical signs of illness. Laughter retards the aging process, gives one a feeling of well-being and tunes up the muscles from your nose to your toes. It is legal, non-fattening, and the government can't tax it! 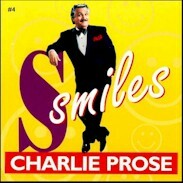 THE FUNNY SIDE OF PROSE is about laughter and when it comes to making people laugh nobody does it better than CHARLIE. To see him in person is an unforgettable experience. 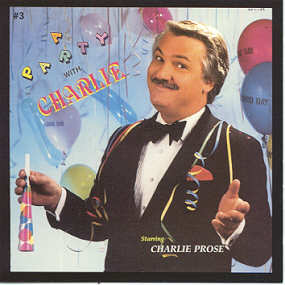 If you have ever attended a CHARLIE PROSE performance, you'll understand why the producers of this album have chosen to title it " A PARTY WITH CHARLIE"
Get together with a few friends and family and play this Cassette or CD. You'll be amazed how much fun you can have with "A PARTY WITH CHARLIE" ! Charlie weaves a tapestry of smiles throughout his audience on this fourth CD/Cassette. His observational humor about everything from kids to old age relates to all of our lives, and has put audiences in stitches from coast to coast. Growing up is reflected in "Dad's Grocery Store," "The Everything Drawer" and "Doin' Chores." Drawing on his own experience as a father, Charlie's "Barbie Doll" routine has become a comedy classic. It's a sure bet you'll find a lot of the funny moments from your own life in "Smiles" - so sit back, listen, laugh, and enjoy! 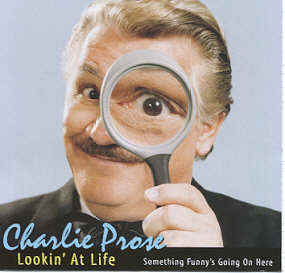 There are few things in life that aren’t hilariously funny when seen through the probing eye of America’s favorite funnyman, Charlie Prose. In this his 5th CD, Charlie puts a uniquely funny slant on life as only he can. From Dads and Daughters to Dumb guys and Darling kids, his family-style humor will have you in stitches from beginning to end. Reorded live at the Civic Center, Coral Springs, FL, "Lookin’ at Life" is destined to become a comedy classic.